Each program is designed to engage your child's different stage of growth to nurture confidence and self-awareness. Our programs provide a supportive learning environment for every child. Here's how you can learn if our school is the right choice for you and your family. Call or email our office to talk to an educator/staff, schedule a tour or request more information. Complete an admissions application that will be provided once we meet! Our toddler classroom offers a small group Montessori experience to children aged 15 months – 3 years, with a 1 to 5 adult/child ratio. The program is offered 9:00 AM – 12:00, Monday through Friday, with the option of choosing a 2, 3 or 5 day program. Additionally, all day childcare is available from 7:30 AM-9:00 AM and 12:00 PM-5:30 PM. The toddler environment is carefully prepared to meet the young child’s special needs in a peaceful, loving and secure space. The intimate setting provides a shared space for the children to practice togetherness, helping them to build trust in relationships. Toddlers are given opportunities to work in the development of language skills, sensorial experiences, art, music, and daily living skills. Another aspect of our toddler education is to support and inspire our parents. We believe that Montessori is an education for life, and consider parent involvement to be a vital part of our understanding. Our primary classroom is for children who are three years or older and fully potty trained. This program is 5 days a week. Half-Day and Full-Day options are available. For half-days, the hours are 9:00 AM – 12:00 noon, Monday – Friday. For children attend the full day, the hours are 9:00 AM – 3:00 PM, Monday – Thursday and 9:00 – noon on Fridays. Additionally, all day Montessori childcare is available from 7:30 AM-9:00 AM and 12:00 PM-5:30 PM. For those children attending for the full day, a rest time will be offered after lunch. During the morning the children are in multi-age groups with children 3 to 6 years old. The primary classroom is a calm atmosphere of exploration and joy. The younger children are guided by the teacher and by observing and working with older students. Children learn to work at a task from beginning to end and develop their self-discipline and capacity for self-directed learning. Respect and consideration for others develop as children grow within the Montessori environment. 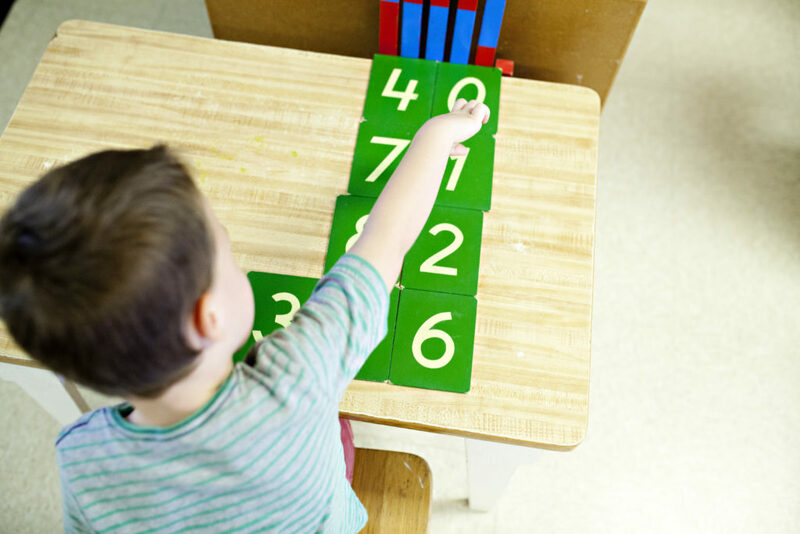 In the Montessori classroom, children work at their own level and pace. For children that are 5 years old, we offer an Extended Day Kindergarten program. The Kindergarten program hours are Monday through Thursday 9 AM until 3 PM; 9 AM – 12 noon Friday. During the afternoons the children work as a group without the younger preschoolers on more academically challenging and abstract material. There is an emphasis on developing social/emotional skills in readiness for first grade. Peer influences and the ideas of fairness and appropriate behavior are all addressed. Our Extended Day Kindergarten program encourages the child’s natural curiosity and desire to learn by engaging him/her in purposeful, developmentally appropriate and self-directed activities. Guides carefully design activities allowing our Kindergarteners to joyfully learn to care for themselves, their peers, and for their class environment. The Montessori In The Woods Summer Camp is designed to be consistent with our Montessori school year program, in a relaxed, more outdoor-oriented atmosphere. Campers enjoy developmentally appropriate projects and activities within the indoor and outdoor classrooms. Our Summer Camp is for children who are enrolled for upcoming school year. Our youngest campers (15 months - 3 years) enjoy lots of fun and water activities in their own outdoor environment. The children treasure their own play area, taking walks in the woods and trails, and picking flowers and vegetables in the gardens. Toddlers who have been enrolled in MITW continue to follow their familiar daily schedule started during the school year, which allows them to be secure and independent in their own movement and choices. The toddler summer program offers warmth, love, independence and continuity. Our primary camp (3-6 year olds) will feature a different theme each week. The goal of our summer program is to offer a balanced combination of Montessori education and theme based fun activities. Children will enjoy the comfort of familiar Montessori classroom routines in combination with outdoor activities, arts and crafts, music and movement, as well as games and sports. We spend as much time outside as possible, with woods, water and nature play. Want To Visit Our School and Learn More?